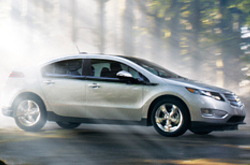 America's best selling plug-in, the Chevy Volt, is the hybrid designed for the new American consumer. Offering unmatched versatility for city & highway drivers alike, the Volt is truly ahead of its class. 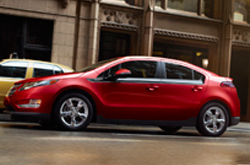 Delivering an unmatched 38+ mile range without the gas engine, the 4-seater�2015 Chevy Volt in Phoenix is hands-down the best working-class hybrid on the market today! As for the ride, the 2015 Chevy Volt is reviewed as one of the fastest electric hybrids on the road, with a track tested top speed of 100MPH! High-performance torque delivers an exhilarating feel, with strong acceleration and sporty handling, while 4-wheel disc brakes and a MacPherson Strut front suspension make sure you keep firmly planted on the road. The Volt's smooth, aerodynamic exterior helps to further make it clear that driving an electric car doesn't mean you have to sacrifice performance or style. Striking details accent the 2015 Chevrolet Volt's interior as well. An innovative cockpit-style center console houses two 7-inch interactive screens to detail all your crucial driving information, automatic climate controls adjust your cabin for customized comfort, and premium cloth (or optional leather) bucket seats conform to both the driver and passenger for ultimate comfort. We want you to compare the newest Volt model head-to-head with other vehicles in its class like the 2015 Ford Focus Electric, Toyota Prius, Hyundai Sonata Hybrid and the Nissan Leaf. That's how confident we are that it's perfectly built for you. Just a few of the attributes that shoppers in Arizona will be won over by are the Volt's eye-catching exterior design and bargain MSRP. For Phoenix Chevrolet customers who want a fantastic value, just compare this vehicle's price to the forementioned vehicle options and you'll see that it's a solid investment. The bullet list below will give you even more details about its vehicle specs! 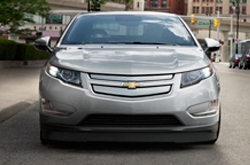 Thank you for reading our complete 2015 Volt review, written by Midway Chevrolet's professional authors. With the help of seasoned automotive writers, we have published some of the best reviews about Chevrolet's models that you'll find online. Every overview comes bundled with helpful facts, specs and research - just what you need to make smart decisions about your next Chevrolet purchase. Now that you've read through Midway Chevrolet's Volt review, please pick up the phone and call us to arrange a test drive or learn about financing offers and deals from the OEM.